Click Here To See If This Sprayer Is Currently Discounted! When you are in the market for the best HVLP paint gun, it would be worth your time to check out the model from Devilbiss. While they aren’t as well-known as some other companies, they are a true contender in the market. Its features and selection of spray tips give it a real edge on the competition. Read my full Devilbiss Finishline FLG-670 HVLP Paint Gun Review to get the full lowdown on what this gun has to offer. When you are ready to get some painting jobs done, don’t go with the brush and rollers. Using a paint sprayer will lessen the amount of time needed to paint. There are many paint sprayers on the market, but an HVLP paint gun is a great option for most projects. HVLP stands for high-volume low-pressure. For the most part, HVLP air caps will not exceed 10 PSI of air flowing through it. The motors produce over 100 CFM at 3-8 PSI. This creates a softer and easier way to control spray than other paint sprayers. You will experience less overspray with an HVLP paint gun meaning that you waste less paint. In fact, some guns can boast a transfer efficiency rate as high as 85%. HVLP paint spray guns have many uses. They can be used in the automotive field for painting cars. You can use them for the primer, paint and clear coat with ease. They are also ideal to use if you want to paint your boat. An HVLP sprayer is great to use for painting projects around the house as well. The lower overspray means less mess to clean up, especially when working outside where mistakes could be costly. If you have small furniture projects that need to be done, this would also work great! Use it with varnish, lacquer or paint to get the job done quickly and efficiently. This HVLP paint gun features multiple fluid tips; 1.3, 1.5 and 1.8mm which are perfect for a variety of tasks. Use your 1.3mm tip for clear coats, base coats, and single stage paints. The 1.5mm tip would great for general purpose uses; light to heavy viscosity materials. Finally, the 1.8mm nozzle tip provides you with a great size ideal for primers. This gun provides a unique and soft spray that offers adjustable patterns. The inside of the gun has been anodized to offer superior protection from wear. The components of the paint gun are made from stainless steel. This creates a durable piece of equipment that is also easy to clean. This gun also includes a 900cc aluminum cup with a plastic cover that is sturdy and dependable. Your jobs will appear to be done by a professional because of the air adjusting valve and gauge that is included. This gun features some really amazing parts that need to be pointed out. First of all, it only weighs 8 ounces. That is a great weight when you need to carry it for a long period of time. You will love the high delivery rate that saves time and money. The fact that the gun is made from durable materials also means a longer life that is worth paying extra for. This gun provides less overspray means more materials end up where they should and there will be less mess to clean up. This is not just a time-saver but also keeps more money in your pocket where it belongs. Being able to purchase an HVLP paint gun that already features several tip sizes means you can get to work faster. It also allows you to use this gun for multiple projects which also increases the value. Most customers are pleased with the performance of this paint gun and would purchase it again. This paint gun doesn’t come with its own filter to help prevent clogging. You can purchase one separately if you choose to. It would’ve also been nice if this gun came with a storage case for when you aren’t painting. Some users felt that the gun could have had a wider fan pattern, but overall it seemed to do the job for most people. 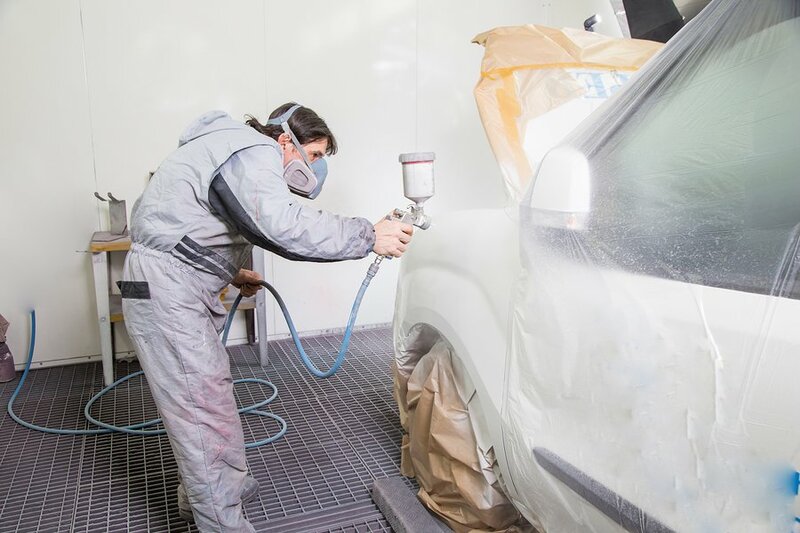 To alleviate any issues with the overall look of the paint job, be sure you practice your spraying to perfect the finish. I would recommend this HVLP paint gun to anyone looking to complete their own projects. The cost is right and it can be used for multiple projects without purchasing more equipment. It provides a great way to achieve a professional paint job without the expense of hiring a contractor.